Yair Rubinstein a/k/a Big Spider’s Back sent us these answers to our questions in this next installment of q and also a.
a: New Beat (mp3) by Toro Y Moi. I love anything and everything to do with funky synth vibratos. a: My friend introduced me to St. Germain a couple months ago. That with soda is the jam. I also like smoothies. But those are more meals than drinks. a: I really enjoyed watching Nathan Fake open up for Four Tet. I don’t think I ever saw his face. He was just a big mop of hair banging his head into his laptop. Really entertaining stuff. 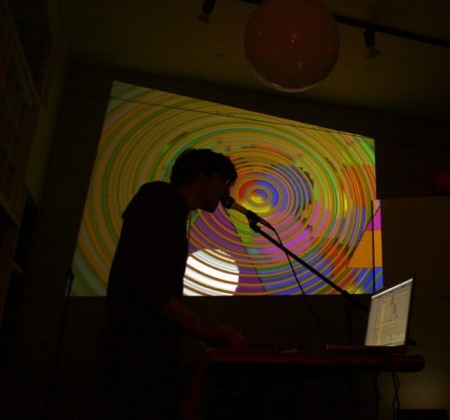 a: I haven’t scoured every venue, but I do enjoy Glasslands. Lots of wood paneling and big puffy clouds. I feel like I’m at a ski lodge in heaven. a: I’m really into ebooks right now. I just downloaded the complete anthology of H.P. Lovecraft. I anticipate reading about three of them. a: I’m finishing up my first full-length right now. I also have some other collaborative projects in the works. We will bring you more details on those projects at some point in the future, but for now listen a couple tracks from Big Spider’s Back. You can purchase a d/l of the Warped EP for $3 @ circleintosquare.com. You can also grab a d/l of the Turns EP for the cost of just one email address @ circleintosquare.com. You can d/l Big Spider’s Back‘s BLANKS podcast @ blanksnyc.com. You can d/l the Pop Massacre Compilation (which features numerous producers including Big Spider’s Back massacring pop songs) from Friends of Friends @ fofmusic.bandcamp.com.